Many industrial processes utilising flammable materials have the potential to give rise to a potentially explosive atmosphere. 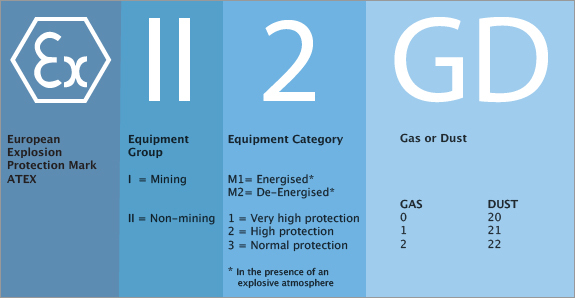 Potentially explosive atmospheres exist where there is a risk of explosion due to mixtures of gas & air, vapour & air, dust & air or other flammable combinations. Where a potentially explosive atmosphere is present, in order to protect plant and personnel, measures must be taken to ensure that electrical equipment cannot ignite that potentially explosive environment. It is therefore necessary to eliminate all sources of ignition which might ignite such mixtures. An explosion is defined as uncontrolled combustion producing a rapid increase in temperature and pressure. 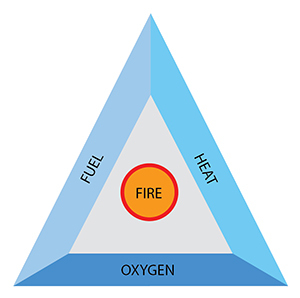 For an explosion to take place, there are three basic requirements; FUEL, for example an explosive gas, an oxidiser, most usually the OXYGEN in air, and a source of IGNITION which could be an electrical spark or hot spot. In order to form a potentially explosive atmosphere, the fuel-oxidiser mixture must be within a particular concentration range known as the explosion limits, which depend on the ambient pressure and oxygen content of the air. There are upper and lower explosive limits dependant on the circumstances of the explosion e.g. energy available and size of containment. Outside of these limits the mixture will not ignite but has the potential to do so if the proportions change. On 1st July 2003 the ATEX Directive came into effect for all EU countries. The Directive provides the technical requirements to be applied to equipment intended for use in Potentially Explosive Atmospheres. The Directive stipulates that a complete and documented assessment of all sites which may have a Potential Explosive Atmosphere is undertaken. This assessment helps determine the actions required, such as the elimination of ignition sources or Area Classification (Zoning). Equipment and products that have their own source of potential ignition. Protective systems - products that control the effects of incipient explosions. Safety devices - products that may be outside a potentially explosive atmosphere but that have an explosion safety function. Components - products that are intended to form parts of equipment or protective systems. To ensure compliance, equipment must meet the essential requirements as specified in the Directive and be marked with the CE marking. Note: Many countries outside Europe and American use the IEC Standards as their own national standards. The purpose of this section is to help identify the key criteria which is applied to the selection and installation of appropriate equipment. This section is intended as a guide only and we advise that expert guidance should always be sought prior to putting equipment into service in a potentially explosive atmosphere or having that equipment maintained or repaired. There are a number of regulations, guidelines and standards which determine the design, installation and maintenance of equipment to be located in potentially explosive atmospheres. There are differences between European and American certification, approval and general practices; therefore individual codes of practice and standards should always be consulted for exact requirements. Where ignition sources cannot be eliminated and a flammable gas or dust area may be present, it is important to assess the extent and duration of the risk to select the correct equipment. This is normally referred to as ‘Zoning’. The purpose of ‘Zoning’ is to provide the basis for correct selection of a protection concept. Areas are classified depending on the properties of the flammable vapours, liquids, mists, gases or combustible fibres/dusts that may be present in the environment and the likelihood that a combustible concentration of that gas or dust is present. 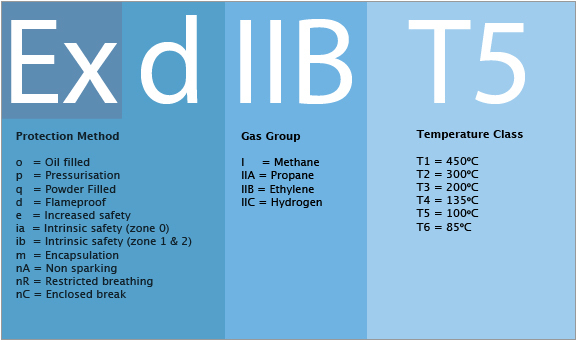 Gases are grouped according to volatility - IIA being the least volatile and IIC the most volatile. The temperature at which a gas will ignite spontaneously with no other source of ignition is the auto-ignition temperature. Auto-ignition can occur when hot surfaces are in contact with explosive atmospheres. There is a classification used to indicate the maximum surface temperature that a piece of electrical equipment could reach when in service. The maximum surface temperature is generally based on a surrounding maximum ambient temperature of 40° C (102° F). The "T"-class of a piece of equipment can be compared to the auto-ignition temperature of gases that may come into contact with it and hence a decision can be made as to the suitability of the equipment to be used in that area. The aim is to avoid ignition of flammable releases that occur in the normal operation of facilities and reduce to an acceptable minimum the probability of a flammable atmosphere and an ignition sources occurring at the same time. Different techniques are used to prevent electrical equipment from being a source of ignition. 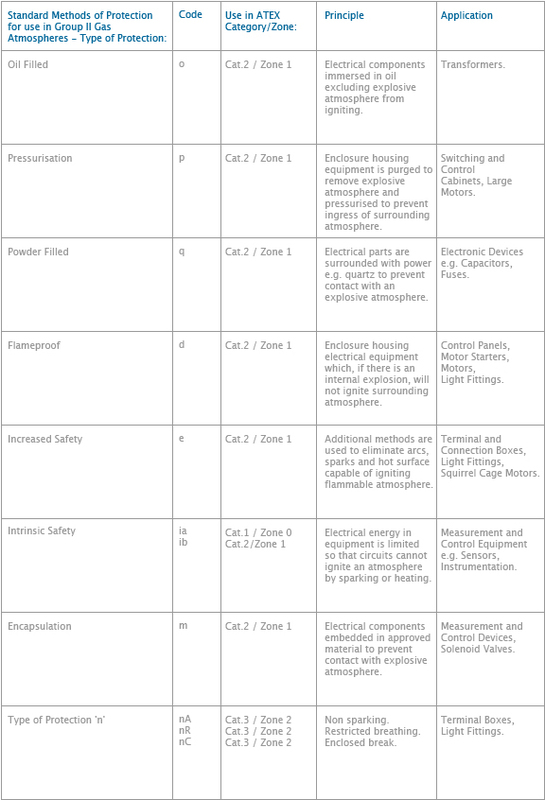 The following table shows the concepts and standards for electrical apparatus for gases, vapours and mists. •	Temperature class or ignition temperature of the gas, liquid, vapour, mist, dust or fibre. 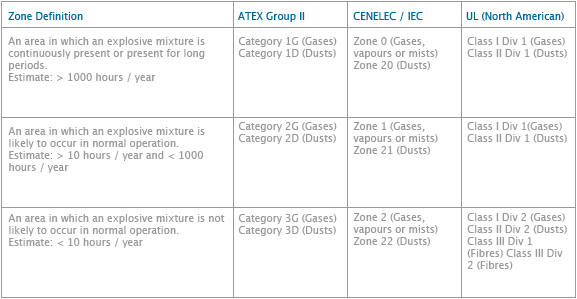 •	The gas, vapour, dust classification in relation to the Group . •	External influences and ambient temperature. •	Geographical destination of the goods (certifying body). The system for defining the levels and methods of protection has been defined and codified. This allows manufacturers to design apparatus of a uniform type and to have it tested by certification authorities for compliance with standards. The IP code of a piece of equipment details the Ingress Protection in accordance with the IEC 529 and EN 60529 standards. It is denoted by two digits, the first applies to solids and the second to liquids. For example a piece of equipment with Ingress Protection IP 67 is dust tight and protected against the effects of immersion. •	Assessment obligations re. the assessment of explosion risks. •	General obligations re. the safety and health of worker. •	Requirements for explosion protection documents. •	Section II, Article 7 of the Directive: In places where potentially explosive atmospheres may occur in such quantities as to endanger the health and safety of workers, the point of entry must be marked.